Operas of the 17th century usually included a serious and a comic plot. By 1700 the comical scenes had largely been removed: the dramma per musica developed into the opera seria. Comical stories were still quite popular and performed between the acts of an opera. Such pieces were called intermezzi. As most opere serie were in three acts, the intermezzi had always two parts, to be performed after the first and the second act respectively. 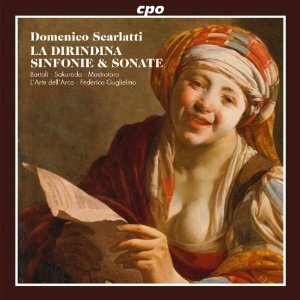 La Dirindina by Domenico Scarlatti is such an intermezzo. The librettist, Girolamo Gigli, called it a farsetta per musica, a musical farce. It is about Dirindina, a young singer who takes singing lessons from Don Carissimo, whose interest in her isn't confined to her singing skills. When she resists his approaches he tells her that other pupils of his are more forthcoming. Dirindina is in love with the castrato Liscione, though. When she and Don Carissimo are involved in a singing lesson Liscione enters and tells her that she has been invited by an opera house in Milan. She decides to go, against the wishes of Don Carissimo. When his resistance doesn't bear fruit, he tells her that he will seek her mother's assistance to make her change her mind. In the second part Liscione tells Dirindina how to behave when she enters the world of opera. He urges her to take profit from the gullibility of opera-lovers from higher circles. He then asks her whether she has any experience in performing an operatic role. She demonstrates her skills in a scene from the story of Dido, using Liscione's sword as dagger. When she performs her scene Don Carissimo approaches and thinks that the scene is for real and that Dirindina really wants to kill Liscione. He hopes she does, because then his rival will be out of the way. She then sings: "Can you so easily tear yourself away from this breast, scoundrel, while you leave me fecund and replete by you?" Don Carissimo thinks she is expecting a child from Liscione: "Either nature or the man with the knife made a mistake". When Dirindina suggests she wants to kill herself he intervenes in the interest of the 'unborn child': "We'll rather send him to the orphanage!" Dirindina and Liscione are beyond themselves with laughter. Don Carissimo still doesn't understand and the piece ends with a trio in which Don Carissimo tries to make the two marry, but they answer: "Stop I'm a capon / Stop, I'm a hen! A pair like that doesn't get together and never lays an egg". This intermezzo was to be performed during the Carnival season of 1715 in the Teatro Capricana in Rome, together with Scarlatti's own opera L'Ambeto, but the performance never took place. The censor prevented the libretto from being printed, "Gigli's text being considered extremely bold, pointed and thoroughly critical of the Roman musical establishment", Federico Guglielmo writes in the liner-notes. He believes that this was the first sign of criticism of the operatic world of that time. The most famous expression of such criticism was Benedetto Marcello's book Il teatro alla moda which was published in Venice in 1720. It seems that there were quite a few people in Rome who were very interested in Gigli's libretto and Scarlatti’s music. Each group managed to disseminate its work through less official channels. Intermezzi are best recorded on DVD. In this case I didn't miss a staging; the performances of the three singers are very good and they convincingly convey the plot and the way Gigli and Scarlatti have worked it out. Obviously the recitatives are more important than the arias which are rather short and not technically demanding. It is essential that there is a vivid interplay between the protagonists; that is certainly the case here. Martina Bartoli, Makoto Sakurada and Giulio Mastrotaro have found the right approach, without ever exaggerating - a great danger in this repertoire. The rest of the programme is devoted to instrumental works. The four Sinfonias are from a group of 17 which have been preserved in manuscript. Some of them have served as overtures to operas, and it is quite possible that the four sinfonias on this disc were also written as overtures to lost operas. They are for strings and bc, but according to New Grove the Sinfonia XV in B flat includes a part for oboe. The liner-notes don't explain why this part is omitted here. The two sonatas are intended for a solo instrument and bc. Scarlatti didn't specify the instrument on which they should be played. Recently I reviewed a disc with performances at the viola d'amore. The violin is a more common option, and Federico Guglielmo gives good readings of these sonatas. The intermezzo is the main attraction of this disc: a nice piece, well sung and played. If you are interested in baroque music for the theatre you should consider this disc.